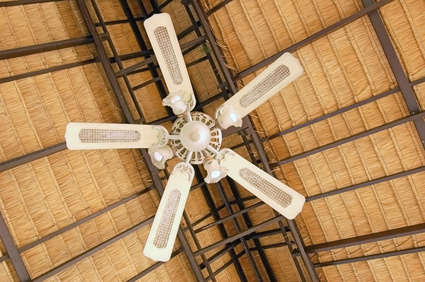 Ceiling fans can keep you cool during the summer months. Ceiling fans are suspended from the ceiling and are used to circulate air throughout a room. Ceiling fans typically have a lamp affixed to the center with blades protruding out from the sides, thereby doubling as a lighting fixture and a fan. Just like other light fixtures such as chandeliers, ceiling fans are not only practical but also add to the aesthetics of a room. The simplest ceiling fans have a set of two pull chains, one to control the light that is affixed to the center of the fan and another to control the fan itself. The pull chain's mechanics are simple. If the light is off, pull once to turn it on and once more to turn it off. If the fan is off, pull once to turn it on at its highest speed, once more to lower the speed, again to lower the speed further and a final time to turn it off. The number of speeds in the fan will vary from fan to fan. There are, however, other ceiling fan controls that might be more practical such as light switch controls, that allow you to control not only the fan's speed but also the brightness of the light. This variation of ceiling fan controls is usually more costly and requires a more complex installation. From simple, practical and underwhelming to modern, sophisticated, contemporary, crafty or tropical, there is a ceiling fan design to meet every design style, so pick one that's right for you and your home. Contemporary ceiling fans are sleek, sharp and simple while tropical ceiling fans have fat, featherlike blades usually made out of wicker. Some designs will go well with other design ideas; for example, a tropical ceiling fan would look good in an eclectically designed room and a contemporary ceiling fan would not. The typical ceiling fan will be installed with the blades at a height of 8 feet off the floor. Sometimes, when there are higher, vaulted ceilings, the ceiling fan will be a little higher than 8 feet off the floor. It isn't recommended that a ceiling fan be more than 8 to 10 feet off the floor because then it becomes more difficult to reach the fan for maintenance and cleaning and, if you have pull chains as your ceiling fan controls, harder to control the fan. If your ceiling is high or vaulted, then use a down rod to bring the fan down. If your ceilings are slanted, then use a mounting kit to adjust for the slope.